The Abbotsford Trust has joined forces with Cornerstone Connects in Galashiels – thanks to the award of a Bank of Scotland Foundation Small Grant. Cornerstone Connects is a day centre for people with complex learning needs, and a group will visit Abbotsford’s outstanding gardens, grounds and facilities for learning on a weekly basis. Cornerstone will work closely with Abbotsford’s ranger, Philip Munro, to make the most of the opportunities the outdoors provides. Cornerstone is one of Scotland’s biggest charities – a leading provider of services for adults and families with learning support needs. The Galashiels branch was recently awarded a ‘Star Award’ for its imaginative approach to providing support, and is the only day drop-in centre of this type in the Borders. There are around 38 people per week who visit the unit to learn new skills, develop social skills and feel part of their local community. The Bank of Scotland grant for this pilot project means that people from Cornerstone will spend a morning a week based in Abbotsford’s Learning Centre, spread over three blocks, each lasting six weeks. A programme of workshops has been designed to give the participants as wide a range of activities as possible; including wildlife photography, natural craft sessions, gardening and bird watching. It gives the groups and their carers the opportunity to enjoy the beautiful 120-acre estate and gardens at Abbotsford, basing activities on the outdoors to increase their knowledge, social skills, observation and fine motor skills. The complete programme will increase each participant’s confidence as they pick up new skills and develop existing ones. A spokesman from the Abbotsford Trust said: “This funding enables us to open up the extensive outdoor space available at Abbotsford to Cornerstone and provide a wealth of experiences, inspiration and enjoyment they otherwise may not have access to. “In addition, we have the Indoor Learning Centre, which will be used as a base, and a team of experienced staff who will lead this programme of activities. 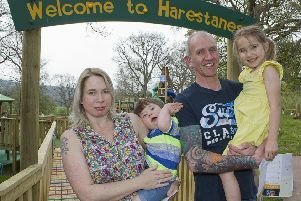 Leanne Gillie, team leader at Cornerstone, said: “Philip at Abbotsford has offered the people we support at Cornerstone Connects a great opportunity to access the grounds and activity centre. “They are learning and developing their skills and understanding of nature through guided walks, sourcing materials for art projects in the activity centre within Abbotsford. “Participants have said how much they enjoy going and the staff at Abbotsford have made us all very welcome, and we look forward to working over the next few months.